There is a reason why Winston Churchill said, "There is something about the outside of a horse that is good for the inside of a man." He knew something about the equine species that many of us are just learning now. Horses are no longer just for transportation, sports or companionship. They are teachers and powerful personal development partners. Horses are like four-legged stars -- bright shining lights that most of us stare at in awe. Their size, their power, and the way they light us up inside have the same effect as a cosmic star in the night sky. For centuries we have used the horse for our own needs and now humanity is learning more about their spiritual gifts. Horses operate the way a mirror does, reflecting back everything we need to see about ourselves. Sometimes the mirror shines on our greatness, joy, happiness and success, and other times it exposes the darkness and our shadow. Just being in the presence of a horse is healing for most people. I can't say I know exactly why or how it works, but I have witnessed many people having break-downs and break-throughs when they are with them, myself included. It is like a magic show and the horses have super-hero, super-healing powers. People come to an equine coaching experience without expectations and they leave blown away at what they saw, felt, released and embraced. My story with the equine species goes back to the age of 10 when I loved them more than life. Over time I was taught to horseback ride with a lot of control and so my relationship to them fed my perfectionism pattern (more on that in my "Pursuit of Perfection" TEDx talk). It hasn't been until recently, 25 years later, that I have seen them in a new way. I started to hear, sense, feel and communicate with them differently as I was attempting to heal one from melanoma cancer. 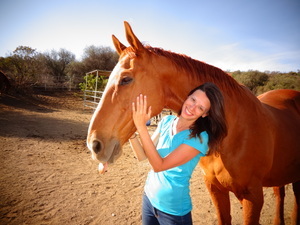 As my best equine friend Felici struggled to stay alive, she began to teach me powerful lessons on rejection, love, connection, communication, authenticity, integrity, leadership, boundaries and self-care. Even in her inevitable passing, I continued to learn so much about death, happiness, surrender and the true meaning of miracles. During this same time I was also volunteering with drug and alcohol addicts in recovery in Malibu. I witnessed them transform as they went through equine therapy processes with the mentor I was learning from. I have been involved in personal development work for over a decade and nothing I had seen or done was achieving results this quickly. I couldn't think of anything that would make me glow more than to be with my favorite creatures on earth and help people at the same time! I quickly stepped into equine coaching as a way to share my favorite passion and my gifts with the world. I knew my training in Spiritual Psychology (I have a Master's degree from USM) paired with my understanding of horses and my own intuition would help me be of service in a unique way. Thus began my Equine Rockstar Coaching business where I lead corporate groups and the general public through 1:1 sessions and workshops so they can overcome obstacles and create more of the success they desire. All of the exercises are done on the ground and no previous understanding of horses is required of the participants. Horses are rockstars because they do their job perfectly and authentically. In a coaching career, they make the best co-workers. The dictionary says that rockstars "inspire fanatical admiration" and this is exactly what happens when people work with them. Most recently I worked with a woman who wasn't even sure she liked horses but she wanted a unique healing experience. By the time her workshop was over she had fallen in love with one of the ponies and that love was so deep that it inspired her to make a conscious choice to give up eating meat for good. It is awe-inspiring to see people come to my workshops stressed out and burdened and leave centered and glowing. Partnering with horses and being their interpreter is both my greatest gift to give and receive. 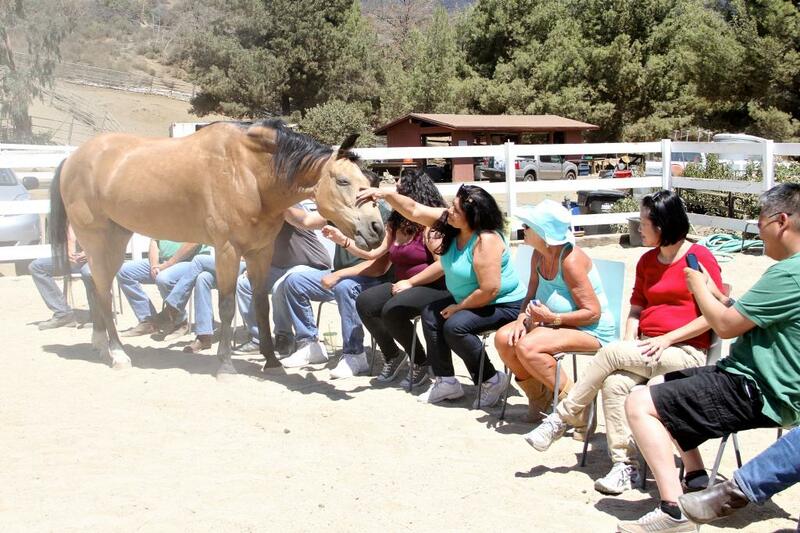 If you are ever in Malibu, CA please schedule a visit at the Connemara Ranch and experience the magic of equine coaching yourself.